VRS Tech offers you the option of choosing the best and most comprehensive Annual Maintenance Contract for all your computer related issues. We provide you the solution to all your IT problems. WE are the most well know brand in the AMC market in Dubai today. In today’s world, life without computers is extremely difficult. Right from your office to your home, to banks and supermarkets, to hospitals and pharmacies- we need computers everywhere. These instruments have a ubiquitous presence in our lives and are virtually indispensable. For larger organizations, it is virtually a death-knell if the computer or other parts in the IT infrastructure give away. It is extremely important to realize that taking care of PCs and other IT related equipment is not an easy job and does require professional help, especially for people who don’t have time to spare. While normal households usually have only one computer, the larger companies have multiple computers and an extensive networking system which is more prone to issues. For this purpose, to make life easier, VRS Tech provides Annual Maintenance Contracts on bulk basis.You get a complete bouquet of maintenance packages at extremely cheap prices. Sinceour tech support team has been exposed to a global standard of service, and the fact that each one of our team is hand- picked to meet our high standards, you can be assured of quality computer maintenance service. We have been in the business of Computer AMC for several years and are quite experienced with the issues that crop up regularly. We also undertake hardware maintenance contract and offer services to different classes of customers, right from individual owners to mid-sized and big companies. We provide you with a tried and tested blend of qualitative service with latest technology which helps us to safeguard your interests. – Assembling and upgrading the PCs. -Repairing of Hard Disks, Modems, Mother Boards etc. – All the services related to Networking. 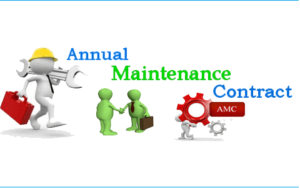 A comprehensive Annual Maintenance Contract is the need of the hour, and true professionals are the ones you should trust with this responsibility. Given our past experience and capabilities which are evident from several satisfied customers, we at VRS Tech are the solution for all you IT AMC needs at extremely competitive prices. Contact us today to get a quote and a list of all the services we offer. We’ll be happy to help you out!